The Yorckschlösschen has existed under same name for over 100 years now and has long-since become a Kreuzberg institution. Following a period as a rather middle-class corner pub in the 1960s, it increasingly became an artists' watering hole in the early '70s. Since then it has been an essential hub of social life in the Kreuzberg neighbourhood or Kiez. This tavern is a true melting pot. Everybody meets here - young and old, poor and rich - and no-one takes exception to anyone else. With a "persistence bordering on stubbornness" (Zitty 18/95), nothing is changed here, and time seems to have stood still - which is the way the guests like it. For the full programme please visit the Yorckschlösschen website. 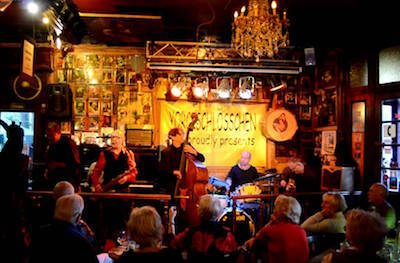 There is a weekly jam session at Yorckschlösschen on Thursdays at 21:00.